Like a first fleet convict, the rhythm of Sydney’s best experience is determined by chains and clinks. You lock and unlock, check for tightness and move along the steel girders of the bridge. It helps you are in a shapeless jump suit, the kind used in American prison movies. They have breathalysed you, to make sure the excesses of the night before don’t cause you to stumble. You are given a hankie which is used for communication, presumably for crying help more than anything more sophisticated. And we are off, clunking and climbing and attaching our safety cords to successions of steel bars, the view getting better the higher we go. Wendy Chung, the bridge climb guide recites the stats you don’t want to hear. How high. How deep the fall, the guy who fell off the bridge into the water and survived, the 16 who died. The steelwork was a sequence of red hot rivets being conveyed and hammered into place. Something that marks out both of Sydney’s most iconic attractions is how close they sit to the horizon to ach other. As you view from Circular Quay into the morning sun the bridge seems to sit like a steel hat upon the ferry boats, and the fans of the opera house sit like fins on the low horizon beyond. Two of Australia’s four tourist icons (the others are the rock and the reef) are effectively in the same oblong square, inviting an instagram moment. The Irish flag is the one that you notice coming up the street. One of the most famous Irish pubs in the world, Mercantile is right at the top of George Street, the hostelry closest to the Sydney Harbour bridge. It is on the corner of an extension of George Street that led through Robert Campbell’s property to the boat operated by Commodore Blue Billy Blue who ran the first ferry service across the harbour from Dawes point to Blue’s point. Beyond that is the Harbour View Hotel. Here, the prevailing sound changes and is dominated by the rattle of traffic travelling overhead on the steel girders. Some motorbikes are parked in a large park beside a refurbished industrial chimney. “Warning: unauthorised climbing on bridge is an offence, maximum penalty of $2200,” reads the sign. No need to worry. The legal climb costs a tenth of that and seems more fun. There is a pylon lookout a little bit further up the street but when you come to number 3 Cumberland Street you can do something perfectly legal and one of the great experiences for the modern tourist in Sydney, the bridge climb. The pre-climb cinema presentation comes without a commentary and, when we watched it, had an atmospheric “replace lamp” note in the bottom corner. There you learn the little details about the bridge, the pet raven that had three young last year, two of whom survived, the thieving magpies that prey on visitors, and Ireland’s contribution to the opening ceremony in 1932: a disgruntled Anglo-Irish activist Francis de Groot photobombed the ceremony. A member of Australia’s version of the Blueshirts, he arriving on horseback to cut the ribbon with his sword and upstaging the left-wing Premier Jack Lang. It is easy to see why it is so popular. Forever afterwards you feel a sense of ownership of one of the world’s greatest tourist icons. You can imagine what the fellow who felt off felt like. Eoghan Corry flew to Australia with Emirates Airlines, who a double daily service from Dublin to Dubai and onwards to Sydney, Melbourne, Perth, Brisbane and Adelaide. He was hosted by Tourism Australian, www.australia.com. 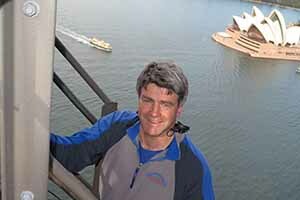 See www.bridgeclimb.com for details of the Sydney Bridge Climb. A one and a half hour sampler costs Aus$148 €100), a day climb Aus$248 (€165), a twilight climb Aus$308 (€205) and a night climb Aus$218 (€145).